Lots of Value , Lack of Sentiment …..16300-16500 crucial. 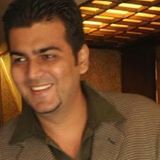 Sensex gave a good breakout at 15950 and made a high of 17735. The target zone we were looking at was around 17500 which was the top of the channel where the momentum would subside for a while or end. The current downmove is coming close to the lower end of the channel at 16300-16500 zone which is an extremely crucial level as the retracement has been in shorterm time compared to the current rally. Considering 17735 to be the intermediate top the downmove should retrace to either 16550 or 15800 which are the major fibonacci retracements. The Channel support is around 16500 zone . The strategy should be to see if Sensex closes below 16500 then investors and traders should also reduce the leftover positions and wait for lower levels of 15800 /15300 or wait for a clear reversal. On a medium term basis Sensex needs to form a bottom higher then 15300 to get back into the higher top higher bottom formation so long term investors should have an eye on that level . 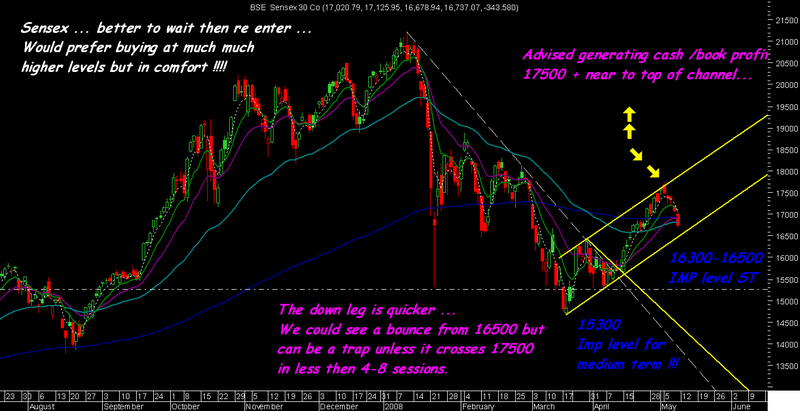 Short term reversal would need to be quick and above 17500 otherwise can also be treated as a bull trap. 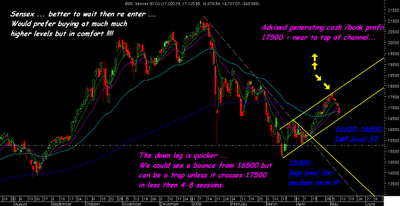 Similarly a breakdown below 16300-16500 should have good momentum !!! So wait and watch around crucial levels. General approach taken by people is to be buying around the lower end of the channel but that works fine in good sentiments and a secular upmove and as of now its a corrective retracement and would not prefer to re enter the stocks booked/exitted at higher levels. Our approach has always been to buy little higher from the lows after a reversal confirmation with comfort then to find the bottoms which u never know about. Simply put investors/traders who took caution and exitted/booked stocks at 17500 levels should wait with the cash for a reversal signal frm 16500-16300 or if a breakdown happens then wait for good dips. There is a whole lot of value but lack of sentiments so investors would continue to get opportunities if they have patience and DISCIPLINE. Majority of the short term picks taken 2-3 weeks back went to the target zones in the retracement to 17500 + . The near term calls initiated notched up 5 % higher and then hit our trailing stops which tend to be 2-5 % so all the calls of near term are booked/exitted fully . Will prefer to wait for fresh longs on reversal or dips and if shorts have to be taken then it should be on a breakdown below 16300-16500. I would again repeat be strict with your stoplosses . Its better to cut on stoplosses then to make bigger blackholes in ur portfolio which continue to suckout ur efforts to gain. No fresh stock calls for now as would prefer to sit on sidelines and continue to advise traders to lower the volumes whether they take a short call or long call as volatility will hit them on both sides.